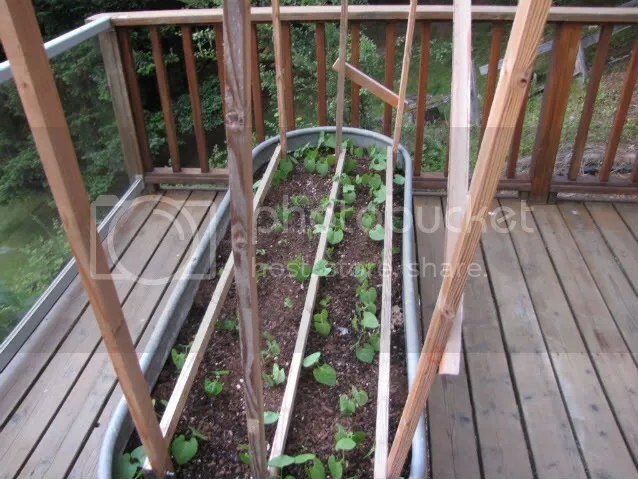 The only place Nolemana and I can have much of a veggie garden is out on our deck. We used to have a huge garden but right now this is all we can do. Better than nothing, right? Everything goes in planters or wine/whiskey barrels. The tomatoes seem to do great, though I really think they’d do better in the ground. We planted nine different varieties, some specialized for Oregon’s cool and unpredictable June weather. I also got some heirloom tomatoes like Heartland and Mortgage Lifter. Nolemana wanted to try a highly recommended yellow cherry tomato, so we have one of them, too. We got the beans planted and they’re growing fast. I adore pole beans; I love watching them grow up the string and I particularly love picking them when they’re ready. It’s kinda like a treasure hunt discovering them hiding in the leaves. We’re using a puka [holey] livestock watering trough for them. Nolemana obviously hasn’t put up the twine yet. 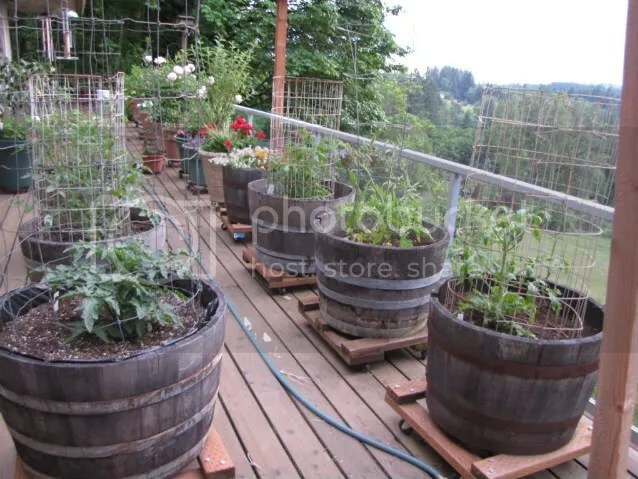 I have zucchini, yellow squash, cucumbers and lettuce planted in other wine barrels. More photos to come. Too good you guyzes! 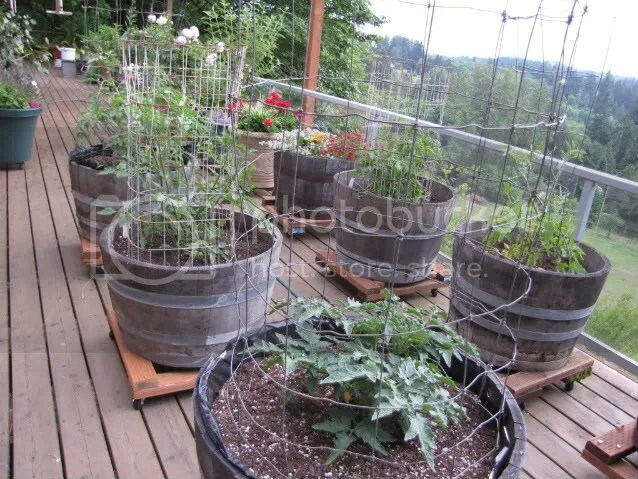 I gotta get dat kine tomato cage and netting fo protek my plants from dose dang starlings dat eat my plants. Great way to organize a barrel garden! Wen get da tomatoes (2 kine cherry, 1 lemon boy and 1 Beefeater) goin good and dey jas COVERED wid lido tomatoes alreddy. And get some yellow squashes… already got 3 keiki peeking up from undah leaves. And da plumies finally stay get dere leaves! Eben got one lido, lido cutting (8 inch tall) wot put out flowahs alreddy! An my Samoa Fluff seeds finally stay pop outta da pod. Now learn how grow plumies from seed. Got pikake vine stay start next to plumies… undah da humminbird feedah… dey know I put dere. How? Is one story. Go out in garden and holdin one plumy stick. Da hummy come right up to my face (I used to it now, first time years ago startle me cuz soun like BEEG bumble bee!) and go side to side and bzzz bzzzz. So I look up. Den da bugga go to my left an make me turn around. Bzzz bzzz. I turn aroun and den da buggah do it two time moah. By dat time i now facin da feedah. Dat silly ting den wen to da feedah, sit down on stick and start sippin. An look up at me. “I know you do dis. I tank you.” Finished sip, came back up to my face, do side to side dance – bzzz bzzzz – and den take off. See um evah day now. All da birds heah come right up to me. Course wen fruits get ripe, tink dey no longer my frens. Out comes da crinoline/petticoat netting to put ovah da tomato cages. Rats can’t stan it! Dey get dey lido toes stuck in it and go nuts. Heh, heh. Eef dis post too long, plese tell. I get lotsa stories but wen no can see hands and motions, den da words take longah.